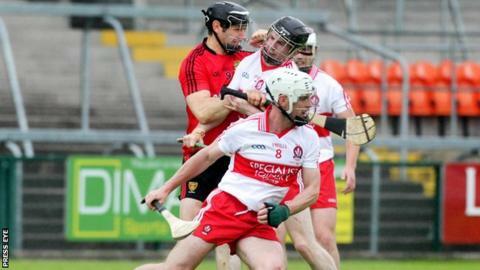 Holders Down hurlers are out of the Christy Ring Cup after they were edged out 2-16 to 3-12 by Derry at Owenbeg. Johnny McCusker's goal gave Down an early lead but Oisin McConvery's three-pointer helped Derry move into a 1-9 to 1-4 lead by the interval. Shane Farren's goal increased Derry's lead to 2-12 to 1-8 but goals from Danny Toner and James Coyle helped Down draw level. However, Kevin Hinphey's last-gasp point earned Derry victory. After their opening losses in the competition last week, both teams knew another defeat at the Dungiven venue would knock them out of the competition and it was Down that succumbed as their disappointing run following their failure to earn League promotion continued. Down started brightly with McCusker's goal helping Gerard Monan's charges to a 1-1 to 0-2 lead after 13 minutes. But Derry worked hard over the next 10 minutes, with a brace of Ruairi Convery pointed frees cutting the gap to two points. McCloskey's three-pointer in the 23rd minute then handed Derry a lead they wouldn't relinquish until the second half. Derry pushed further in front thanks to the efforts of Shane Farren and Convery and led by 1-9 to 1-4 at half-time. Down rallied with three unanswered points on the restart, but the hosts pushed 2-12 to 1-8 ahead, after Farren netted their second goal as the game entered the closing quarter. Toner responded with Down's second goal but Derry moved six points clear with 10 minutes left following scores from Brendan Rogers and Convery. Coyle's goal set up a grandstand finish and after Down captain Conor Woods equalised with a pointed free, Hinphey had time to notch a late winner.